Complete layout,or blueprint specs,of where exactly the casino,and rollercoaster structuers were built?. 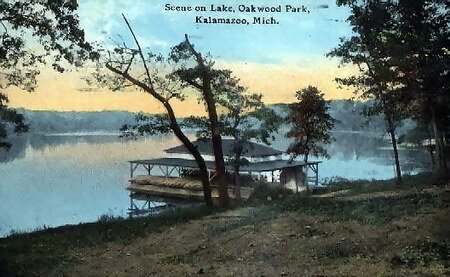 In our first Legends article, Peter Schmidt mentioned an amusement park near Woods Lake in the early part of the Century. I had not known about the amusement park until reading his information, and have since found myself wondering about it and trying to picture it there beside Woods Lake as I pass by the area almost daily. I decided to try to find out more about it. It was called Oakwood Park and it was at the end of the streetcar line from town. The park opened every year on Memorial Day for the summer season, closing on Labor Day. According to a March 23, 1986 Kalamazoo Gazette article, the park had a roller coaster, dance pavilion, shooting gallery, penny arcade, and other amusements. A photograph published alongside the same article shows the columned gateway to the park. The ride out to the park on the streetcar cost a nickel. A Memorial Day opening celebration featured special events such as hot air balloon accession and parachute drops. A Tuesday, Mary 28, 1912 article in the Kalamazoo Gazette described the Decoration Day events: From early Sunday morning until late in the evening, large crowds thronged beautiful Oakwood Park, which was officially opened yesterday, and partook liberally of the many new things provided for their amusement. The crowds began leaving the city for the park early in the morning, but as the day grew older, the rush of people increase until it was necessary for the M. U. T.
to press 12 of their largest cars into service in order to accommodate the pleasure-seeking throng. M. U. T.
officials declare that they carried between 8,000 and 9,000 passengers to the park. In 1893, Kalamazoo electrified its street railway system. Looking to expand evening and weekend trade, the Citizens Street Railway Company extended one of its lines 2 1/2 miles to the south-west along Asylum road and established a park along the shores of Woods lake. The park was named Lake View. 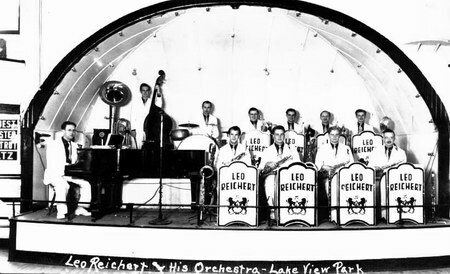 Lake View park opened on June 28 and immediately offered its patrons a host of timely entertainments, including band concerts, balloon ascensions, baseball games, boating, dancing and picnics. Owing much to the Worlds Columbian Exposition of that same year, the entertaiment section of Lake View park was itself even dubbed Midway Plaisance. 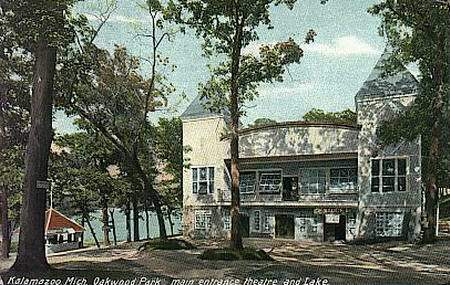 By the turn of the century, summer theatre had become the key attraction at Lake View - so much so that in 1904, the parks name was changed to Casino Park. Vaudeville, light opera and burlesque dominated the bill at Casino Park with occasional feature musical attractions (ragtime was all the rage), minstrel shows and flickering films from a new gadget called the Kinetoscope. In 1907, The street railway company had (again) changed hands and Casino park was torn down and completely revamped. Now called Oakwood, a new dance hall, band stand, nickelodeon theater and boat house were erected, as well as the new parks feature attraction - the Dizzy figure-8 roller coaster. Again, balloon ascensions and band concerts were featured with Chautauqua assemblies and specialty entertainment providing hours of summertime activity, usually for the mere cost of a trolley ride. Oakwoods peak years were during the 1912 - 1914 seasons when upwards of 15,000 patrons visited the resort each day. Then, in the words of former Oakwood park manager Ed Esterman, The War changed everything. 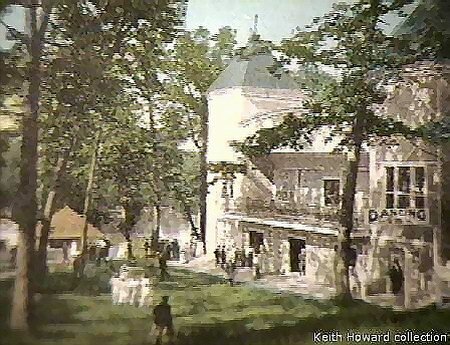 Americans began to discover broader horizons via the automobile and small resorts such as Oakwood offered a somewhat lower level of enticement than in previous seasons. On the other hand, Oakwoods dance hall flourished during the jazz years with nightly dances greeting capacty crowds during much of the warm weather season. 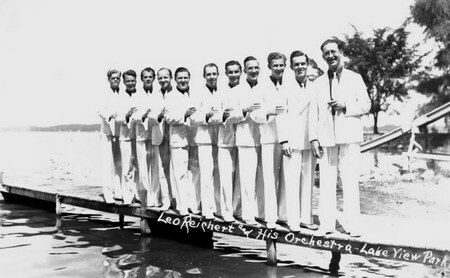 The Kalamazoo community was given its first introduction to the miracle of radio when a 1922 concert by Fischers orchestra was broadcast from Milwaukee and played to a delighted audience at an Oakwood Park radio dance. Owing to declining patronage and following a disasterous 1924 balloon exhibition which resulted in the death of the feature performer, the park was permanently closed to the public on May 3, 1925. The park property was subsequently sold and subdivided into a residential neighborhood known thereafter as Parkdale. Parkdale lots went on sale for the first time in September, 1927.